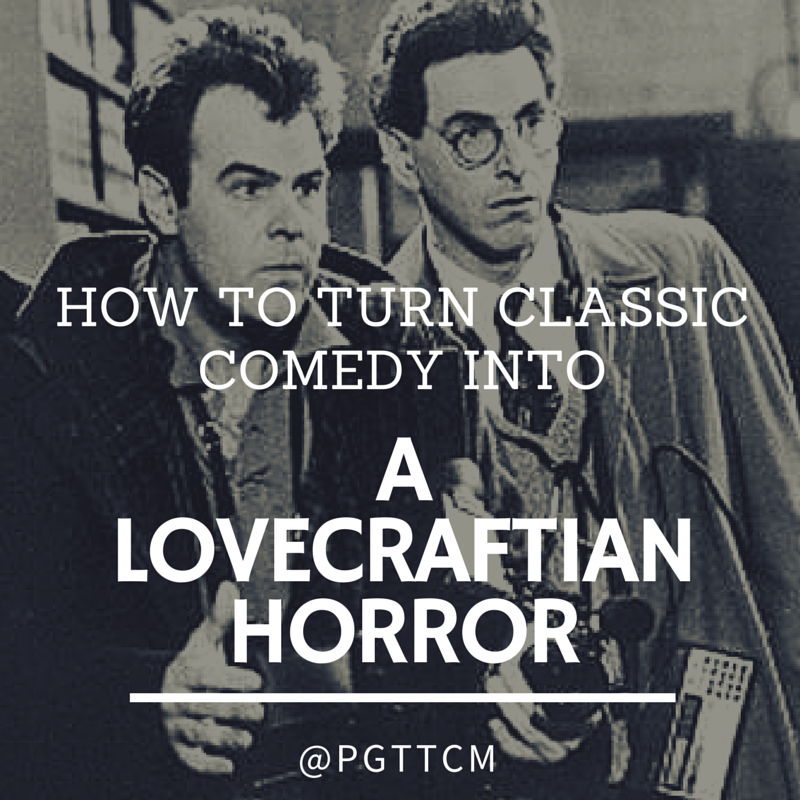 Ghostbusters: How to Turn a Classic Comedy into A Lovecraftian Horror. In 1984 Director/Writer Ivan Reitman, Writer/Actor/Director Harold Ramis and Writer/Actor Dan Aykroyd created one of the greatest horror comedies of all time, an amazing blend of horror and humor. Bill Murray, Dan Aykroyd, Harold Ramis and Ernie Hudson star as a quartet of Manhattan-based “paranormal investigators”. When their government grants run out, the former three go into business as The Ghostbusters, later hiring Hudson on. Armed with electronic paraphernalia, the team is spectacularly successful, riding The Big Apple of dozens of ghoulies, ghosties and long-legged beasties. Tight-lipped bureaucrat William Atherton regards the Ghostbusters as a bunch of charlatans, but is forced to eat his words when New York is besieged by an army of unfriendly spirits, conjured up by a long-dead Babylonian demon and “channelled” through beautiful cellist Sigourney Weaver and nerdish Rick Moranis. The climax is a glorious sendup of every Godzilla movie ever made-and we daresay it cost more than a year’s worth of Japanese monster flicks combined. Who’d ever dream that the chubby, cheery Stay-Puft Marshmallow Man would turn out to be the most malevolent threat ever faced by New York City? When the script for Ghostbusters was forged by Dan Aykroyd and Harold Ramis, John Belushi was slated to play the Bill Murray role; Belushi’s death in 1982 not only necessitated the hiring of Murray, but also an extensive rewrite. The most expensive comedy made up to 1984, Ghostbusters made money hand over fist, spawning not only a 1989 sequel but also two animated TV series (one of them partially based on an earlier live-action TV weekly, titled The Ghost Busters. But if you take away the language, and force the viewer to read the words spoken and ignore the tone they are spoken in some of the humor is lost. Take away the color and turn up the contrast you have a much starker film. It starts to resemble ‘The House on Telegraph Hill” or “Night of the Living Dead”. The sets pop without the unnecessary color hindering their beautiful design, the special effects seem more otherworldly, and lets the musical score feel more timeless and less out of date. Without the color, without the humor all we are left with is the stark horror of New York City on the verge of a major cross-dimensional convergence. New York City under attack by the spirits, a cult that planned to bring about the end of the world, spirit possession, the Dutch, horrifying alien beasts, eldritch gods returning, and cyclopean nautical avatars of destruction. Sounds like Yog-Sothery to me. Horror aside, the main reasons this film works as well as it does without color is because of the work of two particular individuals in the crew of Ghostbusters. One of the greatest art directors/production designers ever, he made movies look as good as they do. His old school approach to films can be seen in the sets, and props. It feels like an older movie, it looks like a much older movie. An amazing cinematographer, and the man who gave Ghostbusters it’s realistic, almost documentary-like look. What am I talking about? Watch it again, watch it in HD. See, that is what I’m talking about. Bill Murray, while a fine actor, most of his humor comes from his voice. If we remove this element of humor we have a far more serious movie, and much of the laughs coming from Rick Moranis and Dan Akroyd in the form of physical comedy. In this version Venkman comes off as a slightly comedic creepy stalker. Dr. Peter Venkman(the Dutch) comes off as a weird lunatic, while Doctors Stanz and Spengler come of as the brilliant scientists they are. Luis Tully is a bizarre homunculus. Winston Zeddmore shines through as the proletariat ghostbuster who loves his city. Yet much like the english version the female characters are just Two dimensional characters for Bill Murray to interact with. While probably a great career choice for Sigourney Weaver or Annie Potts, this wasn’t necessarily a challenging role. In this version you just feel bad for them while Dr. Venkman talks at them making weird faces. Trust me on this part, the special effects still look great in black and white. Get a copy of Ghostbuster on DVD or Blu-Ray, make sure it has French Language as an option. Find the color settings on your television, set your TV’s color saturation to it’s lowest setting(check your owners manual if you don’t know how, if you don’t know where your owner’s manual is, check online for help). Set the language option to “French” in the DVD/Blu-Ray menu(or whatever language you want other than english). Set the subtitles to “English” in the DVD/Blu-Ray menu. Did you watch it? Did you love it? Let me know, and check out People’s Guide to the Cthulhu Mythos available on iTunes. Subscribe, five stars, facebook, twitter, tumblr(google PGttCM). I was 14 when the film came out in 1984 and I was already a Lovecraft reader. I immediately recognized the elements of the Mythos in possessed Louis’s speeches and the parallels of Gozer to Yog-Sothoth with the whole Key Master / Gate Keeper / Traveler thing. Hell, Gozer even has iridescent bubbles on its body. Even then, loving the film as I did, I knew it didn’t work as Lovecraftian Horror because of how easily the insanity of the situation was brushed off by the heroes and how effective scientific inventions were against an Outer God that was around before the Universe formed.